BOOK NOW FOR SPECIALS, Windsor Hills, 5 B/R, Private Pool/Spa, Game Room, Close To Disney, Amazing Amenities! We welcome you to Windsor Hills' a beautiful gated community located just minutes away from the Orlando attractions and a short drive to the beach. The Windsor Hills Resort clubhouse features a huge lagoon-style pool complete with water slide and hot tub, a children’s playground, fitness center, sand volleyball, basketball and tennis courts, a 40 seat movie theatre and video arcade. We thank you for considering this wonderful 5 bedroom and 5 bathroom home, sleeping up to 10. The bedroom configurations consist of 2 king bedrooms, 1 queen bedroom and 2 twin bedrooms giving plenty of space for your entire family. For your enjoyment, the game room features foosball, billiards and air hockey, perfect for some friendly competition. Popular dining options are nearby or simply enjoy preparing meals in the fully furnished kitchen. The private south facing pool and spa has plenty of comfortable poolside furniture for enjoying meals outside and relaxation in the Florida sun. This will be great after a long day in the parks. In addition there is a washer and dryer as well as free WIFI to help you stay connected! We invite you to call today and speak to one of our reservationists or book online. We look forward to your visit! Welcome to the fabulous Windsor Hills Resort. 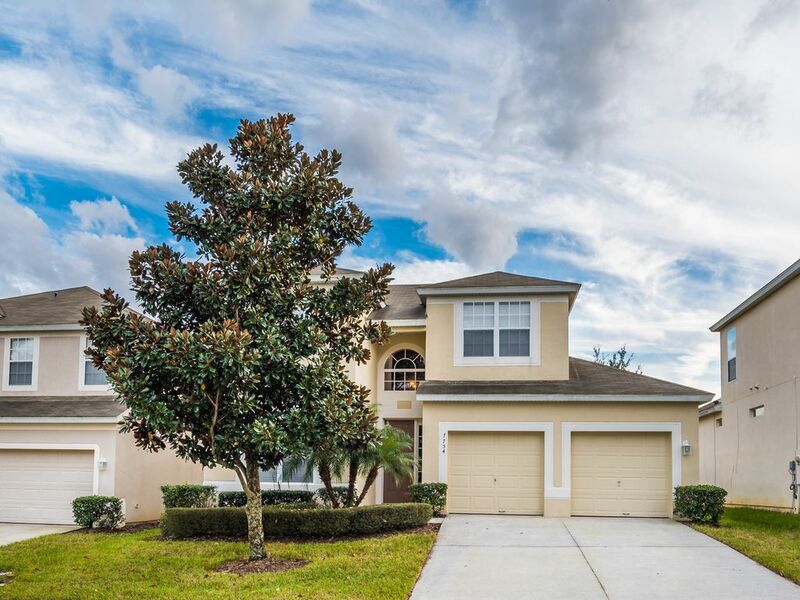 This spectacular gated community is located in Kissimmee Florida and just moments from the main entrance to Walt Disney World. The amenities in this resort offers tons of activities for the whole family. Fun awaits at the massive lagoon style pool which features which features a hot tub and a water slide the kids will love. The resort features every type of outdoor activities once could imagine. You have a children's playground, volleyball court, basketball courts, tennis courts, videos arcade, and a billiards. There is also a movie theater which features complimentary family friendly films in the clubhouse. If you would like to get in some exercise on your vacation, take advantage of the state of the art fitness center. Come stay with us at Windsor Hills and enjoy an Orlando vacation your family will never forget. 5 car limit. Register with guard gate for parking pass. complimentary wi-fi access information provided in the house. Bathroom towels included. Pool towels not provided. Wifi access provided in house. Complimentary. Access to community pool includes the new splash park and water slides! Must have pool heat to have the hot tub heated. My family and I just spent a week here and we really enjoyed our stay. We visit Kissimmee a few times a year so we know not to expect perfection from a rental home. The pool was a little dirty and the game room looked like it had seen better days but compared to most homes we have stayed in this has been with some of the best. The bed was super comfortable. There was plenty of linens and dishes to go around for our family of 9 which was nice. The resort itself was amazing and my grandchildren loved the zero entry pool. I would recommend this home to anyone. My experience from the moment I rented until I checked out has been easy and smooth. No regrets would stay again!! Thank you so much for the review, and for choosing us for your vacation. We are always striving to give our guests the best vacations possible, and I always appreciate the feedback. I am thrilled that you loved the house, resort, pool, and it's one of the better homes you have rented in Windsor Hills. Sorry if the pool was a bit dirty. I will check to see what's happened there. We are here 7 days a week if guests ever need a pool clean. Thank you again for staying with us, and please come back very soon. Pool was dirty and we were unable to use it for a full day. Global homes told me to contact who we paid which was them. Horrible experience with Global and will not use them again. I am a little shocked by this review. We sent someone out the very next day when the complaint was issued to take care of the pool not being clean. I am not sure about the communications, but this was handled promptly and I am a little shocked we received such a negative review. The pools are cleaned when guests check in, but we did send a tech out the next day to handle it. I am sorry you will not be using us again. You are minutes from Disney World and short drive to all other Orlando attractions.